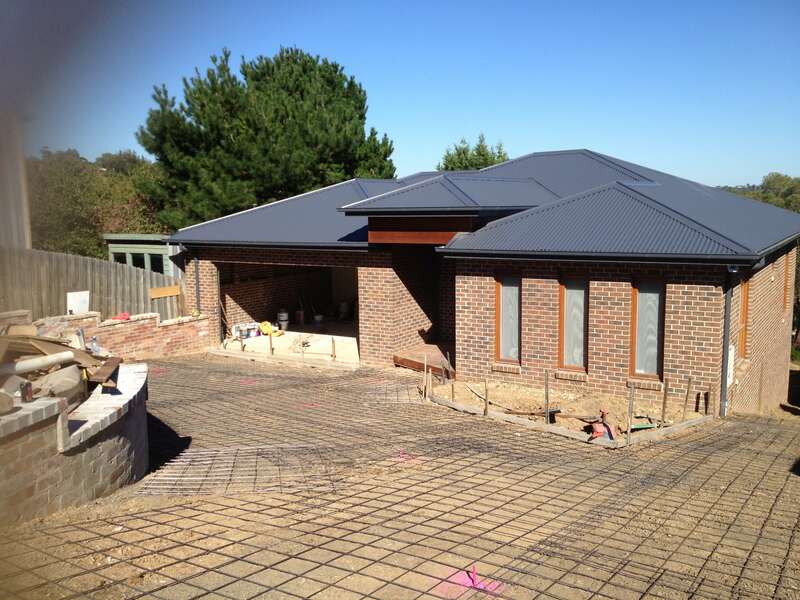 If you are thinking about installing a new driveway, concrete is an excellent choice. Not only is it durable and easy to maintain but it can also be colored and stamped to give it just about any appearance that you desire. That means that you can match your driveway to your home, making it not only practical but also attractive. The following section provides a brief overview of how to build a concrete driveway so that you can decide whether or not this is a project that you are willing to undertake. As with all home improvement projects, the first step involves careful planning. Before you even think about beginning work, you need to have a solid plan in place. Evaluate your property to figure out the best placement for your driveway. Consider how easy it will be to get into and out of your driveway on a daily basis. For instance, if you are located on a busy street, you may find it beneficial to put in a circular driveway so that it is easier to see oncoming traffic when you are pulling out of your driveway. Sketch out your plan on graph paper, making sure that it is drawn to scale. Next, you will need to make a detailed list of all of the materials that you need for your project. That way, you can figure out how much the whole thing is going to cost. At a bare minimum, you will need gravel, concrete, and boards to create a form for the driveway. You may also need rebar to provide structural support. Don’t forget to include the cost of any tools that you need to purchase. For instance, most concrete projects are easier if you have a wheelbarrow, a good shovel, trowels, knee pads, and other types of equipment. Once you have your list finished, you can add everything up to get a price for the project. After you buy all of your materials, you can begin work, assuming that you have already received a building permit from your city. The process starts by leveling the ground. You will need to make sure that the driveway slopes away from your house so that any rainwater won’t accumulate near your foundation. You will also need to lay out the edges of the driveway. Don’t forget to have your utilities located before you begin work so that you don’t accidentally hit a pipe or electrical line when digging. Once the ground has been leveled and compacted and the form is in place, you can begin the process of pouring the concrete. This can be backbreaking work, so be sure to get help if you need it. Don’t leave the surface of the concrete completely smooth. Instead, use a broom to give it a slight amount of texture so that there is some traction for you and your vehicle. Hopefully, this quick overview of how to build a concrete driveway gives you a better idea of the steps that are involved in the process so that you can decide whether or not you are up for the job. Previous Previous post: What Exactly Makes A Good Concreter? Next Next post: All Should You Know When You Go About Hiring A Concrete Contractor?